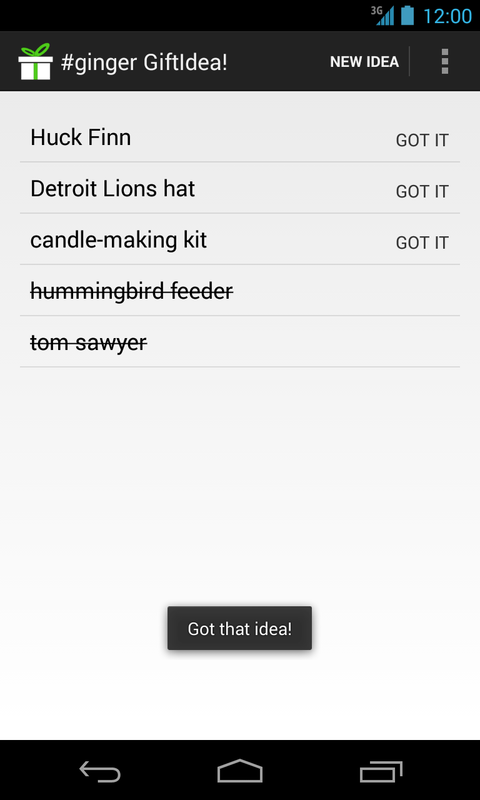 I put an Android app named GiftIdea! on the Google Play Store for the first time last week. I have never needed screenshots for a project before, so I looked around for what other developers are doing. From this bit of research, I created a few principles to follow. Remove everything that has no relevance to the story. I took a few minutes to clear notifications and turned off bluetooth, wifi, and my alarms before taking screenshots. While I generally have bluetooth and wifi on at all times, neither are currently required or used by my app. I think the display is all the better for it. Spotty service and low battery life are guaranteed ways of making me anxious. I use my Android for directions, ordering food, and searching for interesting places on the go. As a result, I’m much more dependent on it than I’d like to admit. I put my phone on the charger and made sure I was within good coverage before taking screenshots. 10% battery life => Is this app a battery killer? Time changes dramatically => Were there problems in development? Time is odd => Why are these screenshots from 4:13 AM? To deal with this, all of my screenshots appear at 12:00 — a consistent and happy time, since many people are on lunch at this hour.